Cirque-Works, with veterans of Cirque du Soleil and the Moscow Circus, blends dance with acrobatics and slapstick humor. Fri., Sept. 12, 8pm. Granada Theatre, 1214 State St. Call 899-2222 or visit granadasb.org. Santa Barbara Dance Alliance presents the 14th annual DaM in a new venue but with the same diverse blend of ethnic dance and music. Sat., Sept. 13, free dance classes outside 2-4:30pm, performance 5-7pm. Marjorie Luke Theatre, 721 E. Cota St. Call 966-6950 or visit sbdancealliance.org. Now in its ninth year, Santa Barbara’s Flamenco Arts Festival celebrates Hispanic Heritage Month with a weekend of flamenco dance and music workshops. 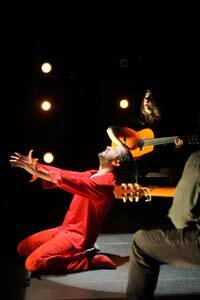 And for one performance only, Spain’s Compa±-a Rafael Amargo presents Tiempo Muerto, described as “a return to his roots, to the pure essence of flamenco.” Workshops: Fri., Sept. 26 and Sun., Sept. 28; see flamencoarts.org. Performance: Sat., Sep. 27, 8pm; Lobero Theatre, 33 E. Canon Perdido St. Call 963-0761 or visit lobero.com. After the show, all are invited to a celebration at Matador Restaurant (714 State St.). Hosted by Debbie Reynolds, this show stars a cast of world-class dance champions in a glitzy and glamorous production. Tue., Sept. 30-Thu., Oct. 2, 8pm. Granada Theatre, 1214 State St. Call 899-2222 or visit granadasb.org. A friend- and fund-raiser for Santa Barbara Dance Alliance, there will exhibitions by local pros and plenty of swing, salsa, ballroom, and more. Fri., Oct. 10, 8pm-midnight. Montecito Country Club, 920 Summit Rd. Call 966-6950 or visit sbdancealliance.org. State Street Ballet presents the classical ballet with music by Tchaikovsky, first performed in 1877 at the Bolshoi Theatre in Moscow. Sat., Oct. 11, 8pm and Sun., Oct. 12, 2pm. Granada Theatre, 1214 State St. Call 899-2222 or visit granadasb.org. This renowned company, established in 1980, strives to reproduce famous classical ballets with Chinese characters while retaining their traditional flavor. Tue., Oct. 14 and Wed., Oct. 15, 8pm. Arlington Theatre. Call 963-4408 or visit sino-china.com. In its 40th anniversary season, this dynamic and world-famous modern dance company embarks on its first U.S. tour in more than a decade. The program will include “Concerto 622,” one of the company’s most-acclaimed-and most-requested-works. Created in 1986, it has not been performed by the company since the early ’90s, and is being revived in special celebration of this anniversary season. Thu., Oct. 23, 8pm. UCSB’s Campbell Hall. Call 893-3535 or visit artsandlectures.ucsb.edu. Under the direction of Christopher Pilafian, UCSB Dance Department students present works by faculty and those of their own. Fri., Nov. 21 and Sat., Nov. 22, 8pm; Sun., Nov. 23, 2pm. UCSB’s Hatlen Theatre. Call 893-3022 or visit dramadance.ucsb.edu. In addition to live music provided by the ensemble, featured dancer Cris! will perform along with the Middle East Dance Ensemble, directed by Alexandra King. Sat., Dec. 6, 8pm. UCSB’s Lotte Lehmann Concert Hall. Call 893-2064. A great Santa Barbara tradition, Jonathan and Sylvia’s popular lindy hop dance classes are followed by a public dance every first and third Friday of the month. Lesson 7:30pm, dance 8:30pm-midnght. Carrillo Recreation Center Ballroom, 100 E. Carrillo St. Call 569-1952 or visit dancesantabarbara.com. Get creative, expressive, or just silly at this weekly dance party, held in an alcohol- and smoke-free, family-friendly space with music provided by deejays. Every Fri., 7:30-10:30pm. Unitarian Society, 1535 Santa Barbara St. Visit danceawaysb.com. All ages and abilities are welcome. Styles include ballroom, country two-step, and Argentine tango. Dances are held every Saturday, 7-11pm, with a lesson at 8pm. Carrillo Recreation Center Ballroom, 100 E. Carrillo St. Call 897-2519 or visit dancesantabarbara.com. Saturday evenings. Zaytoon, 209 E. Canon Perdido St. Call 963-1293 to confirm dates and times. One of the Country Dance Society’s best-attended dances. Every Sunday, with a lesson at 6pm and dancing 6:30-9:30pm. Carrillo Recreation Center Ballroom, 100 E. Carrillo St. Call 682-1877 or visit sbcds.org.